Gladys Nilsson, an unrelenting Imagist painter born in 1940, and Eleanor Spiess-Ferris, age unpublished but of the same generation, attended art school together in the early-1960s in Chicago. For the most part, both have stayed here to live as working artists, exhibiting regularly and selling paintings with enough frequency to encourage a continuous output over the past forty-odd years. The early-60s in Chicago proved to be a highly fortuitous moment for Gladys, as her art was aligned with several others who formed the seminal Hairy Who group under Don Baum’s curatorial direction. Eleanor did not break through with this group. Although the two artists do not have cause to speak to each other, their respective bodies of work are like splinters from the same tree; where Gladys’ art has bloomed in the light, Eleanor’s adapted to the shade. Today, they each have solo exhibitions one block apart on West Superior Street. Perhaps coincidentally, both artists’ fathers were fishermen, which may explain the dominance of water in many of their works. 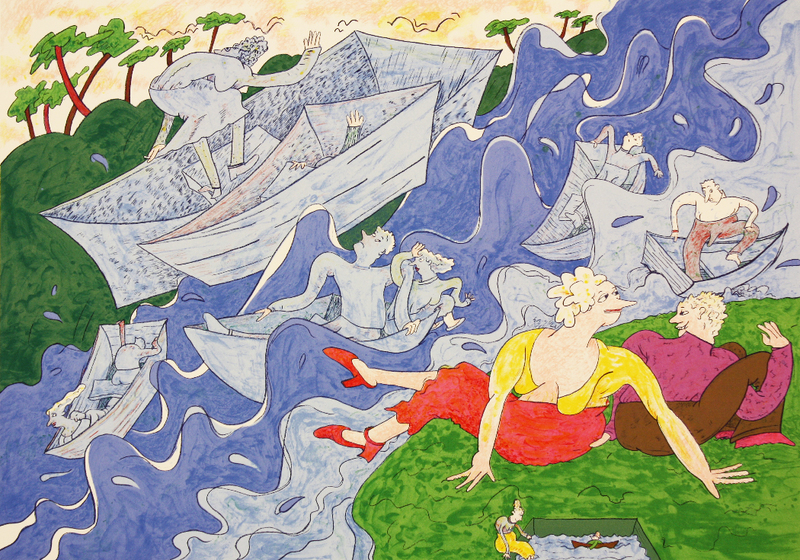 Gladys’ new series features a small rowboat in almost every scene, and Eleanor seems to have been preoccupied with water, the type that simultaneously sustains and drowns, for years. Water is a powerful enough symbol that we, as viewers, shouldn’t have to desire biographic details in order to enjoy the paintings—or should we? But what else is there? Truth? There’s no such thing, says Eleanor, never the mathematician. Beauty? While Gladys’ watercolors are joyful, they don’t prompt rapturous swells of beauty. The paintings “are not specific to my life,” says Gladys, but she admits she sometimes picks up her own biographical details for subject matter. A lot of people ask Eleanor to explain the meaning of her paintings, but she says, “I don’t know!”—shaking her open palms in front of her, as if to say “back off.” Let viewers figure it out for themselves, she says. When pressed, Eleanor says her mind often drifts back to “the orchard” of her childhood, a place where her mother probably shouldn’t have let her play. A speckled robin’s egg abandoned in a marsh. A garland twined from rosebuds. Twilight through the reeds. If you approach a field inhabited by hummingbirds, says Eleanor, they’ll let you know their territorial bounds by going straight for your eyes. Gladys, who likely doesn’t really care what you think of her paintings as long as she can keep making them, freely offers some kindly reminisces. These days she’s been thinking about old age, she says. Her mother died recently, and she’s also come across some photographs of her grandmother, an immigrant (the likely source of all that water and boats in her recent work). 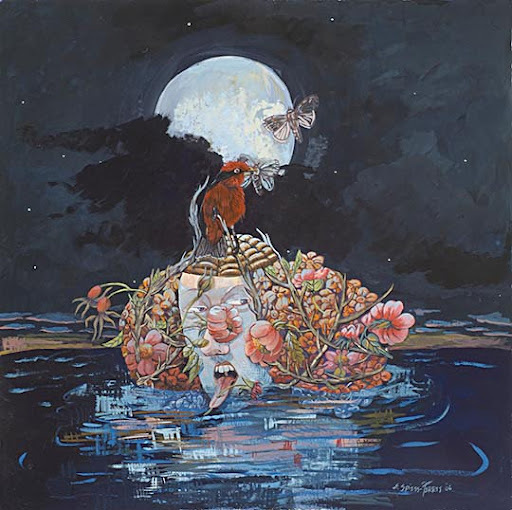 These remembrances have stirred some emotional awakenings in her art. Since taking over her husband’s studio in their home about two years ago, Gladys has found some new wall space to pin up her family photographs and to look at them while painting. I asked Gladys about successors to the genre that she helped beget, and if she enjoys the art of younger Chicago artists who are carrying the flame of the Imagists—painters such as Carl Baratta and Isak Applin. She admits that she doesn’t pay much attention to gallery trends these days. The artists she considers her peers, she says, are people who just want to spend time in the studio. I ask Eleanor about influences, since she developed in the midst of the Imagists. It’s an urban perspective, she says, distant from her own introspective experience. The grime and the gristle of pushing against strangers in the city is certainly part of the Imagist language, but so is the Surrealist celebration of clashing imagery, of the libidinous penumbra that stalks our public faces, of animals that carry messages to humans, of daydreams that spill from our sober beings. Both artists have mastered this approach. Gladys Nilsson shows at Jean Albano Gallery, 215 W. Superior St., through July 3, 2009. Eleanor Spiess-Ferris shows at Printworks Gallery, 311 W. Superior St., through July 4, 2009, and at the Chicago Cultural Center, 78 E. Washington St., through July 5, 2009.